Leaving Tunbridge Wells, heading out west toward Cowden and then through Edenbridge, arriving at the foot of Toys Hill. Keep some energy for the climb to the top taking a minute to rest at the National Trust car park. Onto the brakes for the ride down Yorks Hill, passing Bough Beech Reservoir. A quick ride back into Tunbridge Wells via Penshurst. Leaving Tunbridge Wells take a right turn down Vauxhall Lane towards Tonbridge. Follow the B2017, Tudeley Road on towards Five Oak Green. Pass through the south side of Paddock Wood and up towards Laddingford. The home stretch takes you through East Peckham and Golden Green before rejoining the A26 and back up Vauxhall Lane and home. Ride out of Tunbridge Wells towards Groombridge and then on to Hartfield. Take a left turn down Butcherfield Lane before making your way through Cowden, Mark Beech and Chiddingstone Causeway. Don’t miss the junction onto Station Hill, a short climb and lovely descent takes you down into Penshurst. Keep enough energy in your legs for a few hilly sections that bring you back into Tunbridge Wells through Speldhurst. Heading north out of Tunbridge Wells to Tonbridge and then turning east towards Paddock Wood. The majority of this route is flat and therefore a good opportunity to push up the pace. Keep something in the tank for the last climb up Gate Farm Road to Bidborough Ridge. Leaving Tunbridge Wells west down Groombridge Hill and out through Hartfield before heading north to Edenbridge. Toys Hill, the highest point of the Kent Downs and a great challenge for any cyclist. A great downhill section take you through Ide Hill and past Bough Beech Resevoir. Before you know it you'll be riding back into Tunbridge Wells through Southborough. 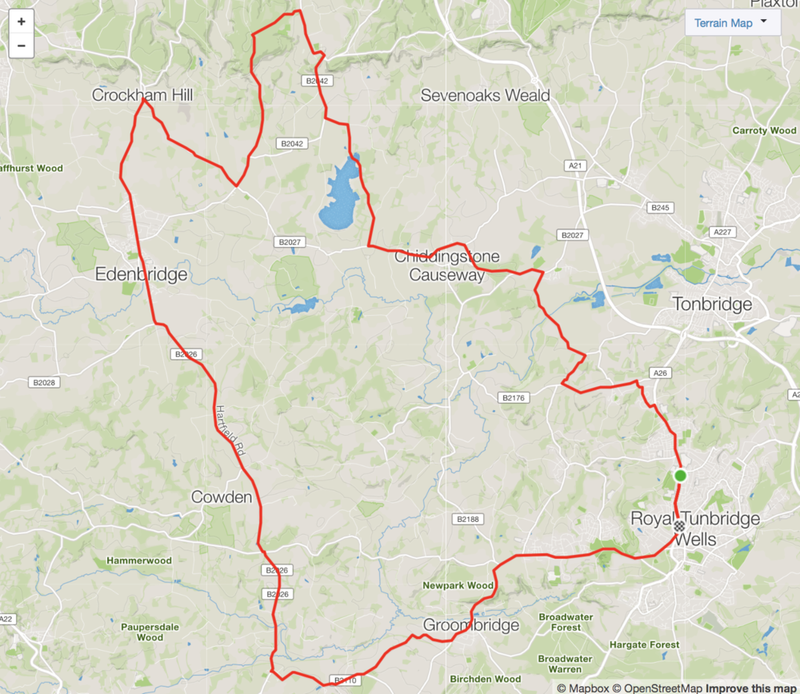 A short mainly flat ride out towards Penshurst, on to Hever before looping round through Leigh, Hildenborough and back through Tonbridge, climbing up Quarry Hill and back into Tunbridge Wells. Heading south out of Tunbridge Wells through Bells Yew Green and down to Mayfield with several sections of climbing and descending before the route flattens out as you leave Horsmonden. Heading north until you get to the village of Yalding and then turning south again to arrive back into Tunbridge Wells through Pembury. A good workout for the legs taking in some of the best climbs in the area.Heading out towards Forrest Row and on towards Colemans Hatch before the climb up Kidds Hill. From the top of the Ashdown Forest you've got a great downhill section into Fairwarp. Then heading north back through Rotherfield and into Tunbridge Wells. A great ride to the coast through some of the best Kentish countryside. Heading out through Tonbridge, Horsmonden, Goudhurst and Benenden before the final section, taking you through Rye and along the coastal path. Keep some energy reserves for the climb up Battery Hill before descending into Hastings.